Here are some of my magazine page designs for Focus Magazine. Scroll over the image to see a brief description of the piece at the bottom of the image. Click on the image to enlarge. Due to the complex and controversial nature of our gender identity magazine, I decided to take a strikingly barren direction for the cover design. The use of a loud orange color and in-your-face text properly fits our November 2017 issue on activism — a topic based around those who passionately embrace the issues around them. 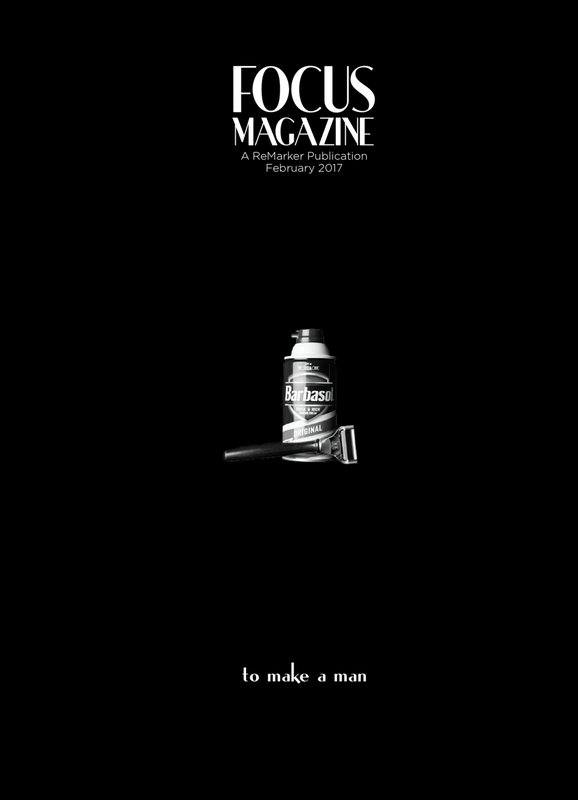 Though simple, this cover played off of a typical stereotype of manhood — shaving — and used unique typography continued on the inside of the magazine. After shooting a picture of this bouquet of flowers, I quickly realized the metaphor at hand. Despite the horrors of that night, the community had come together, rebuilt and bloomed in the aftermath of it all. With so many great photos for this magazine, this table of contents page used photos not used elsewhere in the magazine in order to tease the interior content and capture the reader's attention. It was important not to over-design the inside pages for this issue of Focus Magazine. With so many great quotes and photos, a simple yet consistent design was my focus while designing these pages. Here's another inside page I designed for the issue of Focus Magazine on the "path to manhood." The photo on the right broke our design theme of studio portraits on black backgrounds — however, this baseball field environmental photo stands out even more when juxtaposed with the other photos. While working on this magazine, I knew readers would be most interested in reading our in-depth feature on our headmaster's path to manhood. Because of this, his story demanded a striking division page in the middle of the magazine. Our headmaster's personality was something I believed to be a vital aspect to capture in these pages — with this, we decided to create a bar on the right of the page with his various emotions and faces from our photoshoot with him. Without over-cluttering the page or taking away from the powerful photos, my goal for this table of contents page was to use a variety of photos that capture the city's response to the shootings. As the centerpiece story of this magazine, officer Misty McBride's page design was intended to ease readers into the start of her powerful story. The photo of our skyline lit in blue after the shootings shows just how deeply our city felt the impact of the shootings. Because of this, the photo felt like the perfect way to finish the 28-page magazine. For our November 2017 issue on activism, we decided to include the circle-based design element established on the cover throughout the magazine's interior pages. 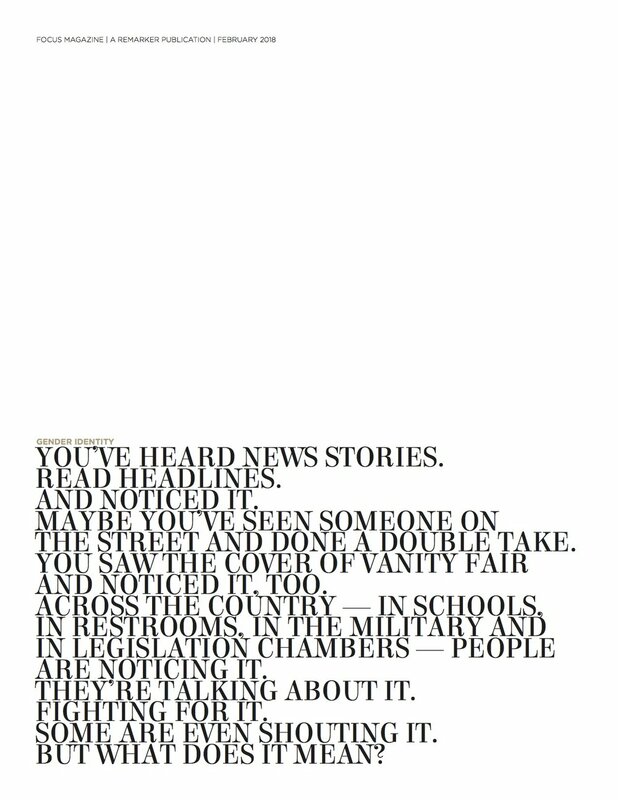 By allowing the drop cap to interact with the facing page's striking image, the spread used a black-and-white contrast while still maintaining unity between the two pages.